Once we had a number of sites launched, we realized the rudimentary tool for managing the content on each wasn't going to cut it. We had made some poor assumptions that introduced an unacceptable amount of friction and constraint. Content-as-interface is cool, but limiting. Originally, we had a desire to remove all administrative screens from the application. We reasoned it made most sense to work with content directly in much the same manner as we had explored with our Author. However, by the time we had finished our fourth or fifth client project, it became clear that this approach resulted in an incredible amount of repetitive work and hampered usability. As part of our strategy to use client work to flesh out our feature set, we needed a system that would unify the disparate elements of each of our sites. 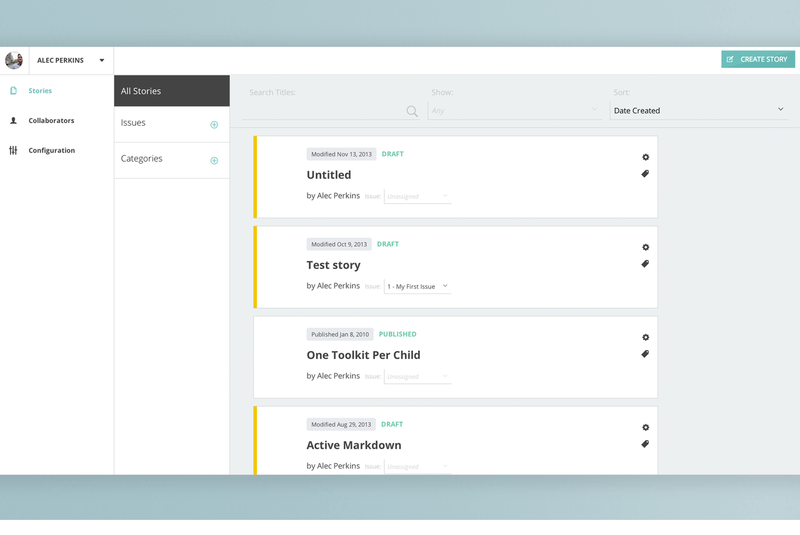 Things like categories, issues, tags, scheduled publishing, and collaboration could benefit many of our users, but were only available to a select few because it was just too hard to keep everything in sync. Once again, we had to step back and start simplifying. Like the Author, the Dashboard is an exercise in restraint and readability with an eye toward publisher-specific extensibility. A module-system provides publication-level features like collaboration, organization management, and editorial oversight. Users can invite others to create stories, design layouts, import media, and otherwise contribute to creating great content. Understanding what’s being worked on, what's been published, and where it lives has never been simpler. The Author and Dashboard are two wholly separate applications that interact with the crowning engineering achievement of our team — a modern, robust, and dynamic programming environment for working with web-native content. It brings unprecedented speed and flexibility to designers and developers building ambitious applications while ensuring open access to the underlying content in perpetuity.